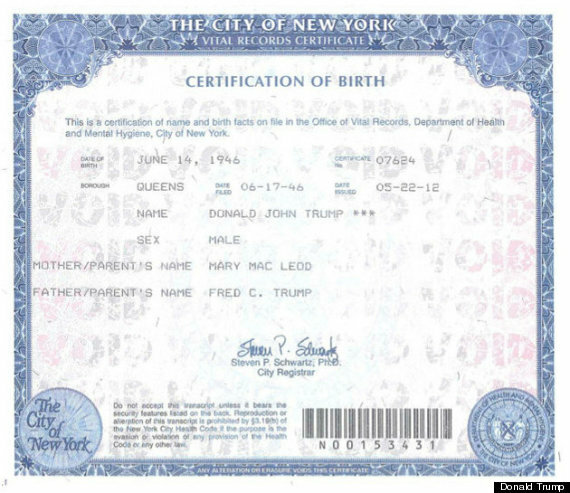 Attached hereto is a copy of Mr. Trump's birth certificate, demonstrating that he is the son of Fred Trump, not an orangutan. Never one to back down from a fight, no matter how stupid, Trump said he was taking Maher up on his offer. He sent Maher a copy of his birth certificate (right), accompanied by the lawyer's letter quoted above, and later sued when Maher did not pay up. "He made an absolute offer. I made an absolute acceptance," Trump opined. "I showed him documentation, and he owes me $5 million, which I'm going to give to charities." Like so much of what the Trumpster says, this is wrong. The Hollywood Reporter has a good analysis of why it's wrong. Basically, Maher didn't make an "absolute offer." He made a joke, and so there was nothing for Trump to accept. Of course, theoretically anybody who wanted to get out of a contract could say he was "only joking" when he made the offer, so the rule is that it's considered an offer if an "objective, reasonable person" would have viewed the statement as an offer. If so, then someone can accept it and form a contract. Probably the best-known case on this is Leonard v. PepsiCo, in which a court rejected a high-school student's claim that Pepsi owed him a fighter jet.